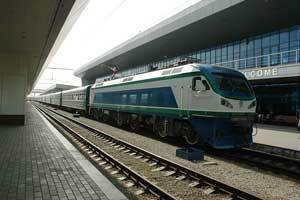 The state railway company Uzbekistan Railways is one of the largest in Central Asian region. It was established in 1994. The company took over pertinent to Uzbekistan's territory assets and rolling stock of the former Central Asian Railways (also called the Trans-Caspian Railway). The Central Asian Railroad has been the main transportation route within Uzbekistan, connecting Bukhara and Samarkand in the south with the capital city in the northeast. The line also has had two major branches leading to other parts of the country: one branch runs southeast to Termez, and another one runs northward to serve the Fergana Valley cities of Angren, Andijan, Farghana, and Namangan. Nowadays Uzbekistan Railways fully meets the country's needs for transportation of cargo and passengers. At present Uzbekistan has 3986 kilometres of a ramified network of railway lines for general use. The railway lines are being continuously renovated and reconstructed. More than 16 million passengers are transported annually. 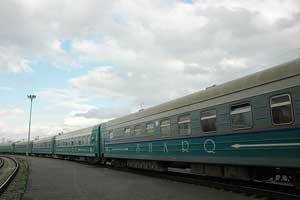 Uzbekistan Railways takes an active part in the international transportation of passengers and cargo. The Kungrad - Beynau - Aktau railway line running to the Kazakh port of Aktau and further through Russia to the European countries is extremely significant. This is the only direct way from Central Asia to Europe. This trunk railway has become even more important after there was opened in 2004 the Caucasus - Crimea railway ferry crossing, which introduced the shortest route connecting the south of Russia and Central Asia with the Ukraine and Central Europe. Due to increasing popularity of Silk Road tourism of special importance is so called Central Asian transport corridor, which links by railroads such countries as Kazakhstan, Kyrgyzstan, Uzbekistan, Turkmenistan, Iran, and Turkey. A considerable part of this route runs through the territory of Uzbekistan – "The golden section of the Great Silk Road"
Among various Silk Road Railway tours of special interest is the train tour "The Silk Road from the train window". As is generally known, the Great Silk Road started in the capital of ancient city of Xian in China, reached Dunhuang and then split into two main branches running across the Tarim Basin. The northern branch crossed Xinjiang, passed over the Tien Shan mountains, ran across Semirechye (south-eastern part of modern Kazakhstan) and reached Chach - Tashkent. From here it traversed the Syr Darya river and then across the Jizzak steppe it headed for Samarkand and further on towards Bukhara. From Bukhara the road branched into two principal trails. One of them led to the north towards Khorezm, Caspian coast steppes and Russia. Another branch ran southwest across Margiana and Khorasan to Persia, and further to Asia Minor and the Levant. The route of the new rail travel virtually follows the footsteps of the ancient caravans. It starts from Druzba railway station on the border between China and Kazakhstan. To make traveling on board most enjoyable the train offers the passengers comfort, civility, and quality service. Each compartment features two wide sleeping births, an armchair, a wardrobe, bathrobes and slippers, air conditioner, radio, TV, compact disk stereo cassette receiver, DVD, internet access, conductor call button, a small table, luggage racks. Adjacent to each compartment there is a bathroom with a sink, shower and toilet. Tourist train also comprises two dining cars, kitchen car, saloon car, medical post, service and maintenance cars, sometimes a shower car. The tourists are escorted by multilingual guides and qualified train staff. Since 2005 one more legendary city, Holy Bukhara has been linked with the country's capital city by a fast train Sharq, which covers the distance in 8 hours. In terms of comfort business-class and economy class passenger cars of Sharq train are not inferior to Afrosiab express train. Silk Road Railway tours will be forever etched in travellers' hearts and minds; they give a unique opportunity to immerse in fascinating history and culture of Uzbekistan's most alluring ancient cities and to explore their glorious monuments. Uzbekistan railways timetable from Tashkent Station. 8 Karshi 08:30 Tue. Wed. Thu. Fri. Sat. Sun. 14:10 Tue. Wed. Thu. Fri. Sat. Sun. 54 Kungrad 16:50 Tue. Fri. 14:40 Wed. Sat. 56 Urgench 19:30 Sun. Tue. Fri. 13:05:00 Sun. Tue. Fri.
58 Shavat 19:30 Mon. Thu. Sat. 13:45 Sun. Tue. Fri.
160 Samarkand 07:00 Sat. Sun. 09:08 Sat. Sun. 5 Moscow 19:00 Sun. Mon. Wed.Fri. Sat. 13:53 Mon. Tue. Wed. Thu. Sat. 315 Ekaterinburg 02:15 Fri. 15:20 Mon. 322 Almaty 16:37 Wed. 19:16 Thu. 324 Volgograd via Urgench 16:50 Sat. 10:30 Tue. 334 Saratov via Urgench 16:50 Mon. Wed. 10:54 Thu. Sat. 365 Chelyabinsk 01:20 Wed. 12:27 Fri.
381 Ufa 00:21 Tue. Thu. Sun. 07:11 Tue. Thu. Sat. 383 St. Petersburg 20:20 Tue. 02:52 Sun. 395 Kharkov 22:58 Fri. 07:28 Tue. Timetable of Uzbekistan Railways from the station ... to the Tashkent station. 7 Karshi 16:05 Tue. Wed. Thu. Fri. Sat. Sun. 21:43 Tue. Wed. Thu. Fri. Sat. Sun. 53 Kungrad 08:53 Thu. Sun. 07:50 Mon. Fri.
55 Urgench 15:20 Mon. Wed. Sat. 10:28 Tue. Thu. Sun. 57 Shavat 14:20 Tue. Fri. Sun. 10:28 Mon. Wed. Sat. 159 Samarkand 18:00 Sat. Sun. 20:10 Sat. Sun. 6 Moscow 22:48 Mon. Tue. Wed. Thu. Sat. 16:13:00 Tue.Thu. Fri. Sat. Sun. 316 Ekaterinburg 17:54 Mon. 08:10 Thu. 321 Almaty 15:02 Mon. 11:17 Tue. 323 Volgograd via Urgench 20:02 Tue. 15:17 Fri.
333 Saratov via Urgench 16:17 Thu. Sat. 15:22:00 Sun. Tue. 366 Chelyabinsk 06:57 Sun. 19:10 Tue. 382 Ufa 11:35 Tue. Thu. Sat. 18:53 Mon. Thu. Sat. 384 St. Petersburg 07:38 Sun. 10:57 Thu. 396 Kharkov 02:23 Wed. 10:28 Sat.